Christmas is creeping closer and closer, as in, it's next week! But until these 12 Days are up, let's take a look at some more music, Idols and Christmas joy! Let's go! So it's early in the morning (thanks to some idiot texting me at 4:30am... seriously!?) and I remembered that I hadn't yet written my next review for the 12 Days of Idols series, so why not get cracking now that I can't sleep and feel annoyed, because what's better to combat stress and annoyance than Idols, music and Christmas cheer, aye? So to combat my stress and annoyance during this jolly time, I will be taking a look at a mini cover album from Takagaki Ayahi, who I had no clue about until about a few days ago when I came across this little treasure of songs. Surprisingly enough, she's an Anime voice actress and singer, and a bloody good one at that, who has now covered popular songs twice that range from popular songs to broadway hits in her Melodia covers. This one is, quite obviously, a winter cover album containing a few seasonal songs as well as a few that just show off how absolutely gorgeous Ayahi's voice is. Oh, and nearly all of the songs, bar one, are sung in English, or Engrish. That's pretty impressive if you ask me, then again, I rarely hear a Japanese singer take on the challenge of covering a song in full English, so it's nice to hear that effort in this mini album. 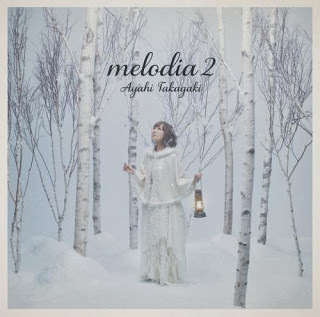 So that all said, let's take a look at Takagaki Ayahi's second mini cover album, Melodia 2, and get into the festive season with this beautiful cover of songs. Are you ready for the melody of winter to find you? The first track present on the mini album, Seasons of Love is a cover of the Broadway musical song from RENT. Originally I did wonder where I had heard this song before, because I had no clue about the name but I knew the tone and instrumental, until I looked it up and found out that it was from a musical my sister had once tried to get me to watch. I still have yet to watch RENT, but seriously, I'm quite interested in seeing it now, more out of curiosity as well as the beauty of this song. Now when I first heard the song on the album, I was extremely surprised by the fact that Ayahi had sung it in complete English. This actually applies to nearly all of the songs on this album, but I was still taken aback that she had not covered the song in her mother tongue, however it did really impress me greatly. There is a lot of effort put into singing the song, both in power and in another language, and you can really hear it in Ayahi's beautiful, angelic voice. She hits the notes perfectly and just sounds so beautiful when she sings the song, and her English is pretty amazing. It isn't perfect, but it still sounds good and I can understand her perfectly. The second song on the track list for this mini album is one of the most well known Christmas songs around, and the one you have to watch out for when singing; you can either make or break this song, and sadly the standards for covers of Mariah Carey's All I Want for Christmas is You are set very high in terms of vocal quality and talent. Luckily, I find Ayahi's version charming and fun. It isn't my favourite cover on this entire album, in fact I was disappointed that I didn't like this one more (I love this song) but I still think that she did it justice. The song itself is very cheery in general, and I found Ayahi's take on the song quite cheerful, upbeat and endearing. Her cute accent when she sings in English is extremely cute and fun to listen to and just gives the song its own charming, Ayahi-like character rather than just being a carbon copy of the original with different vocals. She has fun with the song, thoroughly enjoying it and putting her all into the song. Sure, it isn't the best cover of this song that I have ever heard, but Ayahi's take on this gorgeous Christmas song is still adorable and filled with effort and happiness, and I truly appreciate that. She has such a lovely voice, and you can see that she put as much personality, cheer and effort into this song as she did with Rent's Seasons of Love. It's enjoyable and fun, and her Engrish is downright adorable in this song. In fact, her accent is the thing I love the most about this cover - it's so cute and endearing! The next song, Memory, is one that I am vaguely familiar with. When I saw this title in the track list, I couldn't help but think to myself 'isn't that the one song from CATS?' and by goodness, I am correct! Given I have never watched CATS, I am rather impressed by the fact that I remember this song and where it's from... then again, I have quite a few Broadway-fanatics for friends who adore this piece, so now it's less of a surprise that I remember the song and where it's from! Now that that has been said, I actually like this song anyway, but to hear Ayahi's take on it is a treat in my opinion; her voice hear is earthy, powerful and passionate, filled with this gorgeous tone and energy that is just so befitting of this song. She sounds absolutely amazing, and when the song hits its most powerful moment, the sudden change in Ayahi's voice is absolutely breath-taking because she sounds like she has just had a burst of power and passion, with the rest of the song being this beautiful, heavenly build up with her already glorious voice. She sounds amazing, to put it bluntly, and of the three tracks we have heard so far, this one is the best of the three because of how beautiful the composition and Ayahi's voice coupled together is. It has such a beautiful build up, bringing great anticipation the more you listen to it as you wait for that almighty ending where Ayahi just brings out that full power and energy in her voice. It is such an impressive piece, one which is just fantastic, and one of the most memorable pieces on this track list that Ayahi has covered. This is a song that I think you should definitely check out to really understand what Ayahi's voice is all about, and what she can do as a singer. I don't think that there is anyone on this Earth who does not know this song, because it's so popular and well-known by people of all ages; originally produced in the 1950's and performed by Doris Day for the film The Man Who Knew Too Much, Ayahi's cover of the song is reminiscent of the fun and ambitious sound that Que Sera Sera has. As a song, I absolutely love the sound of Que Sera Sera. It's so carefree and energetic with a sound that is fun and flouncy. It also has such a nostalgic quality about it, and paired with the charming tone of Ayahi's voice and that endearing accent, I find her cover of the song rather beautiful and enjoyable. She still has that power behind her vocals, but there is a more airy approach about Ayahi in this song, as if she is singing it with a carefree mindset rather than trying to sing in a certain tone or pitch. She sounds amazing, and there is such a happy and enjoyable tone about her voice in this cover that it makes the song all the more enjoyable and fun in my opinion. It helps that this type of song really suits Ayahi's voice I think. It just works so well with her vocals! This cover is a fun one if you ask me, bringing on a more approachable and carefree air to Ayahi as a singer. I find it amazing that for each song, she can bring a different sound and attitude to her voice, and this one is no different. She sounds glorious with this chipper, upbeat tune that really brings out that sweet happiness about her personality and vocals, and because of all of this, Que Sera Sera is one of my favourite tracks on this album. Can you blame me for loving it? Another song that I am slightly familiar with, Ayahi's cover of Charlotte Church's Dream A Dream is the fifth song present on her cover album, and is yet another song that shows off the amazing ability of Ayahi's voice, this time showing off her amazing talent as a soprano singer. Now I am not the biggest fan of this song (though I do adore that opening to the instrumental!) but I do think that Ayahi does it justice. She brings such a mature vibe to the song, and her vocals are once again strong and powerful, bringing an unearthly, chilling sound to the instrumental that is both beautiful and unsettling in a way. Whilst not my favourite song on the track list, and the one I am least likely to listen to after this review, I can't deny that Ayahi does this song absolute justice, or that the song itself is extremely beautiful when you listen to it. The piece itself is extraordinary anyway, but accompanied by the mature and talented vocals of Takagaki Ayahi, the song is a rather chillingly beautiful arrangement that really captures you as a listener, and allows you to truly appreciate just how amazing this talented young woman is as a singer. Here is one of the few songs that I am not overly familiar with on this album, though I do know of it. Think of Me, that song from the Phantom of the Opera, is the sixth and final English cover song from Melodia 2 and another perfect example of just how wonderful Ayahi's voice is and what it can do. I swear, her voice is so impressively flexible, I can't help but be amazed by it! This song shows off that amazing opera-like, soprano quality of Ayahi's voice, more than what Dream A Dream did, and really breaks the boundaries of what we have heard Ayahi already do when singing the other songs. She still sounds amazing, her voice mesmerising and enchanting, romantic and compassionate as well as chilling at some points. This song truly shows how far her voice can go and what it can do in terms of singing ability, and is just a beautiful example of how sweet and strong her vocals truly are. Those ending notes especially show off that amazing vocal ability that Ayahi has, amazing me every time I hear it. Her voice throughout this entire song is just stunning, and I wonder how I haven't heard her sing beforehand because this voice of hers is just so stunning and captivating. Think of Me is not my favourite song on the album, but I think that it is a great example of Ayahi's ability as a soprano singer. It is yet another song that shows off just how flexible her voice is with various songs, and really allows us to hear this gentle, compassionate side to her voice that we have not heard with the other songs on Melodia 2. This is a beautiful track, one which is wonderful to listen to and a track that truly allows you to appreciate the beauty that is Ayahi's voice. Another glorious track, to put it simply. The final track on the album, Toki yama ni hi wa ochi te is actually from Takagaki Ayahi's single Meteor Light, and the only Japanese song on the entire album. This beautiful song further demonstrates Ayahi's talent as a singer in this winter composition with a rather sad-sounding piece, one with a lot of emotion behind it, and shows off just how heavenly and angelic Ayahi's voice truly is. When I hear Toki yama ni hi wa ochi te, I can't help but think of old Christmas shows and songs that I heard when I was a child. It sounds like a classic Christmas sound, one which is slow paced but still loving and heavenly. It isn't festive and upbeat, but it still has that Christmas, winter-like feel to it that reminds me of Christmas choirs and carol singers. In fact, it reminds me of the tale of A Christmas Carol by Charles Dickens, or the cartoon The Snowman. It has such a nostalgic presence in the instrumental and really does remind me of how beautiful a Christmas song can truly sound. I like this song a lot, it just sounds so beautiful and has a classic presence that truly makes me think of an old fashioned, family orientated Christmas rather than a modern day Christmas where we listen to pop tunes and over-indulge on gifts and food. It's reminiscent of what used to be, showing off Ayahi's beautiful voice and her amazing talent as a singer. I am glad that this song was put into the album, because it allowed me to hear the glorious tone of Takagaki Ayahi's voice in her mother-tongue, and allowed me to appreciate that undeniable talent and beauty she has in her voice even more. It is stunning, and like all of the other songs present on Melodia 2, this track is truly breath-taking. After listening to the entire Mini-album, I can safely say that I am extremely impressed by the beauty and talent of Takagaki Ayahi's voice. She truly does have a gift for singing, and with each song I could just feel myself falling in love with her more. Paired with the charming and endearing accent she gains when she sings in English, as well as the power and emotion behind her voice with each song, I have enjoyed this album thoroughly. To say that I am glad I took a gamble and listened to this album is an understatement, because I am over the moon knowing that I decided to listen to it and give it a chance. I originally thought that, because Ayahi is in anime voice acting and sings anime openings and endings, she would be a sub-par singer who could hold only one tune, but I was wrong about that. Instead she is an amazing singer, one who brings a different personality and charm to each song, and proves just how amazing her voice truly is by singing in various tones and mediums, from pop to classical arrangements. She shows just how flexible her voice is, demonstrating with each song the power behind each track despite how different each song may sound. It is truly amazing to hear that sort of sound and talent be demonstrated on one album, with only a few songs. Given that, as an Idol fan I listen to only Idol music mostly, I truly was amazed by how different Ayahi could sound each time, bending her voice for each track. I am used to Idols singing in one tone, never changing how their vocals sound or even the emotion behind their voice, but today I heard a true artist at work, and honestly, it was beautiful. Everything about Melodia 2 is wonderful. It's perfect. It's a great mini album filled with amazing cover songs that are so different, but oh so glorious. Takagaki Ayahi is truly talented, and I am so happy that I was able to listen to these gorgeous tracks. 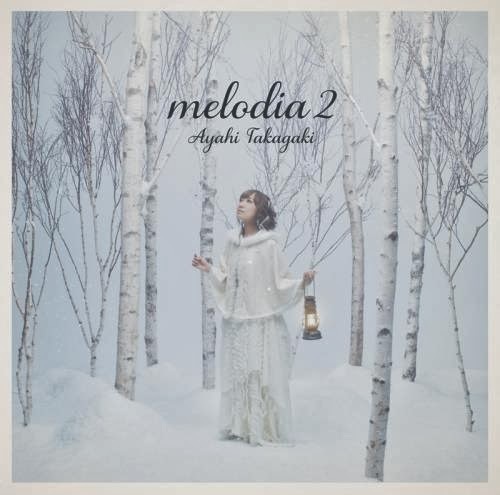 So, with the review written, the songs listened to, what do you think of Takagaki yahi's cover album, Melodia 2? It has certainly peaked my interest, and it makes me want to listen to her first cover album Melodia (especially since it has Defying Gravity on it!) as well as more songs from her. It's amazing how you can think one thing about a person, but then become completely taken aback the next moment by their glorious talent, isn't it?